It's March and I can hardly believe that we have reached this leg of our journey... see what I did there? This month's theme for the #UnconditionalBodyBeautiful is all about legs. I have learned so many things from my little legs and I am really pleased that I finally have a chance to tell you all the story. As a kid and young adult, I never had an issue with my legs, I never looked down on them and thought negatively about them. I don't remember feeling self conscious about them in shorts when I was in my teens either and I thank my lucky stars that I wasn't a child or teen in this day and age, with all this nonsense of needing a thigh gap. When I got a bit older, I'll say of university age and I gained more weight, I noticed my thighs got a bit lumpy and less smooth and began to feel a little more self conscious about them. I wore longer shorts and skirts and every outfit became a knee length outfit. I am telling you about my outfit choices because it is an important detail for the next part of the story. 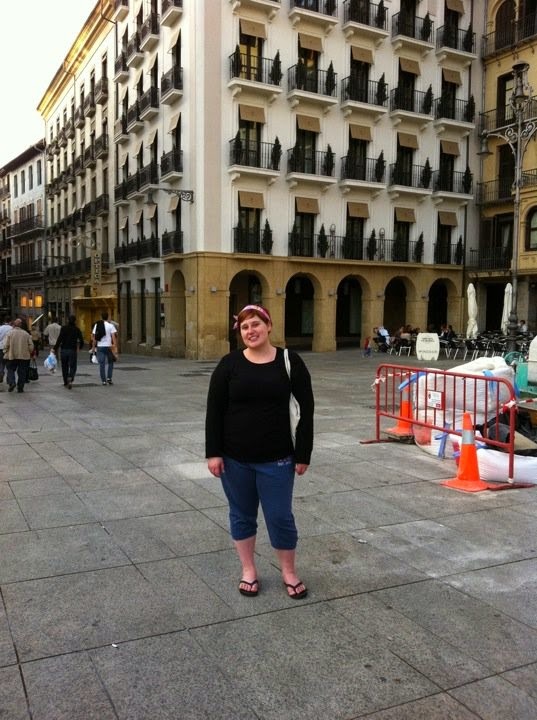 As most of you know, I moved from Canada to Paris, France in May of 2010 and stayed for a year. Prior to moving to London, I had got it in my head that I wanted to accomplish something big and prove to myself that I was capable of following it through. I set off on a train in May of 2011 to a small town at the base of the Pyrenees mountains in France called St Jean Pied de Port. From there, I began a 500 mile (800Km) walk all the way over the mountains and into Spain, on the pilgrim route called El Camino (the way). It took me 33 days with 2 days rest to complete and to this day I wish that I had taken more time, as there was nothing like the journey. I had not trained and didn't have the best equipment but even still, managed to complete it, after only breaking down once at the half way point and considering giving up. Why am I tell you this, you might ask? Because it was those very same lumpy thighs that carried my body for those 33 days. I wish that I could have had them out in the sun more and showed them the way, but thanks to the ever present threat of chub rub, I kept them in capris. Purely for comfort, this was probably for the best but still, it would have been nice. Fast forward a couple of years, an older, bigger, more mature and body confident version of myself is sitting in a tattoo parlour, about to wage war on the same thighs that I somehow have neglected to love, despite them carrying me all this time. First, I began with a sailor pinup on the right thigh and even to this day she is still missing a few details, but being half way accross the world from your tattoo artist makes it hard to finish it. Next, less than a year later, I started on the left thigh, where I had a distinguished portrait of my beloved 18 year old chinchilla, Kenobi done by Amy Savage, here in the UK. 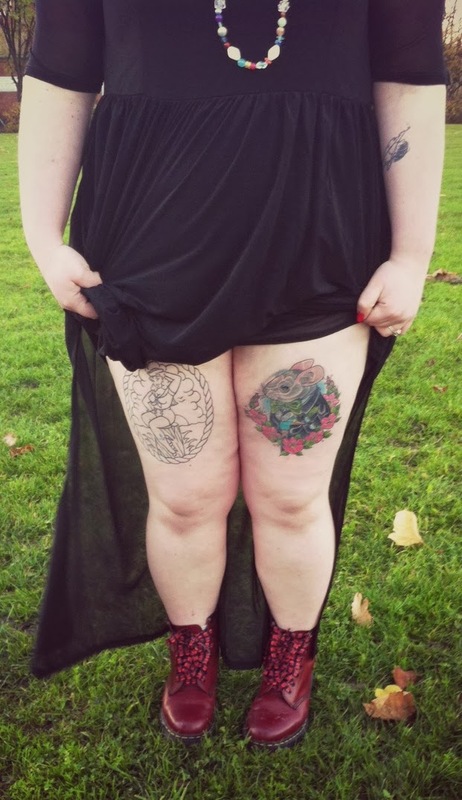 I don't want to imply that tattoos are a fix or an instant body confidence booster, but the day that I got tattoos on my thighs was the day that my mind caught up with my body. All of a sudden, I realised that if these thighs could carry me everyday, and be an important place holder for to works of permanent art then they deserve to be loved and on show. Since then, I am back to wearing shorts, I worry a lot less about what others think and I love getting my legs out in the Summer. Without sounding too preachy, if there is a part of you that you don't love, try and think about what that part of your body does for you, what it accomplishes and how well it does it. I love my legs and am grateful that they are there to carry me through life. So there you have it, the story of my legs. Be sure to check out all the amazing other participants of the #UnconventionalBodyBeautiful challenge.